Maximus Stirner. Fridericus Engels pinxit. 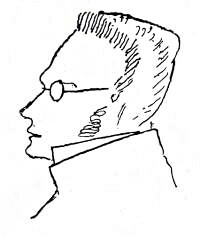 Johannes Kaspar Schmidt, melius notus nomine Maximus Stirner (Theodisco: Max Stirner, natus Baruthi die 25 Octobris 1806; mortuus est Berolini die 26 Iunii 1856) fuit philosophus nihilista et anarchista theodiscus. Fuit insignis anarchista individialisticus et suae operae influentiam Friderico Nietzsche, etiam Caroli Marx et Friderico Engels dederunt. Arena, Leonardo V., Note ai margini del nulla, ebook, 2013. Vicimedia Communia plura habent quae ad Maximus Stirner spectant. Novissima mutatio die 25 Octobris 2016 hora 13:23 facta.